What is the Lowrance Hook 4X Best For? 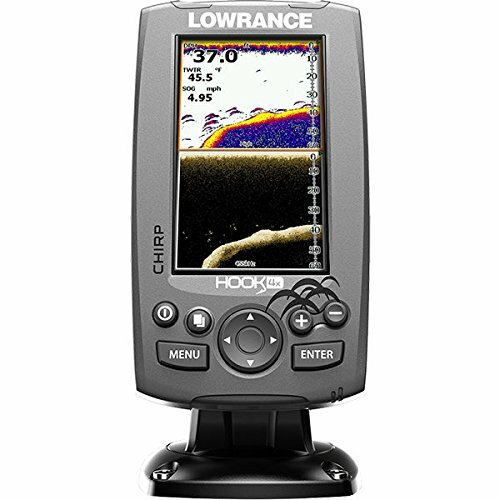 Created by the world-renowned fishing electronics brand, Lowrance, the Hook 4x is a brilliant display of the 60 years of innovation the company has behind it. Having founded fish finding technology over half a century ago, Lowrance still holds the reigns as one of the world leaders in dynamic fish finding devices. The Lowrance Hook 4x is a reliable down-imaging fish finder, showcasing all the values of the brand as well as its timeline of experience in the industry. Utilizing hardy materials and high-quality components, this dual-technology, down-imaging fish finder boasts clear imaging, cutting-edge software, CHIRP sonar, and history trackback features. If you don’t own your own boat, or you’re into kayaking or fishing, you’ll be likely looking a device you can move around. This has the portability you’re looking for, easily unscrewing from your boat, kayak, or canoe. We’ve put together a guide, breaking down our expert opinion on the Lowrance Hook 4x. By showcasing its pros and cons, we highlight the main features and walk you through the best applications for this device. So, read on, and we think you’ll be as hooked as we are! Designed for any level of angler, this simple-to-use down imaging device features high-quality imaging for a clear picture of what is beneath the boat. A great value for the money, this device combines some of best features on the market, with some of its own unique integrations, to provide a sturdy, accurate fish finder for all aptitudes. Below are some of the main features that make this product stick out from the crowd. While simple to use, this device actual harnesses the power of two complementary technologies, to provide a clearer image of what’s below. The Hybrid Dual Imaging system, exclusive to this product, combines two award-winning technologies – both of which were engineered by Lowrance. The device combines exclusive DownScan Imaging and a broadband sounder to provide a deep and broad view of what is happening below the boat. By synchronizing two CHIRP sonar ranges, this fish finding device is able to separate targets more accurately and define the shapes more clearly. The cross-overs in range enable the fish finder to distinguish between grey areas, reducing the noise and sharpening the images. The translates to a more precise image for the angler. The DownScan Overlay technology helps users to better understand what the device is saying. This technology, exclusive to Lowrance, overlays the DownScan Imaging. This overlay goes on to the broadband sounder display, separating the fish targets from their surrounding environment and any vegetation or noise that may blur the image. The overlay software is fully adjustable, enabling you to work through different color palettes to suit your needs and manipulate the transparency of the overlay. Lowrance’s Trackback software is installed on this device, enabling you to look back over the sonar history of your session. This software enables you to cover the ground you saw and pinpoint interesting spots, without having to retrace your steps. The chart plotter is designed for you to mark waypoints to visit next time. The high-resolution display measures 4.3 inches and provides a luminous color image, with a high level of detail. The Advanced Signal Processing, unique to Lowrance products, means that few manual adjustments are needed to get started seeing fish clearly on this screen. The device has eight preset display options, with up to three split-screen modes, enabling you to monitor your broadband sounder, DownScan Imaging, and chart all at once. This product comes with a year’s warranty, showing the confidence the brand has in its product. Customers automatically are also part of the Five-Year Lowrance Advantage Service program, meaning you receive support throughout your experience as well as upgrade options. What makes this down imaging fish finder such great value for money is the broad range of high-level features offered? By combining some of Lowrance’s top unique technologies, this pocket-sized, portable fish finder is a great device for all skill levels and helps give a great broad picture of what is below the craft. Let’s take a look at some of the major reasons why this is. 2D CHIRP Sonar: For such a small device, this fish finder has a quite advanced and powerful 2D CHIRP sonar, allowing you to receive incredible messages about what is happening below. This is especially enticing as the fish finder comes at such a good price, placing it above its competitors. Hybrid Technology: The hybrid DownScan and broadband sounder technology give this fish finder a boost. It not only allows you to see down below the boat but pushes the imaging out to give you a broader sense of what’s happening. This gives a much clearer picture, allowing you to distinguish the targets from their surroundings. DownScan Overlay and High-Resolution Screen: These two features really give you a sharp picture of what is going on below the surface. Not only are the transparency and color palettes completely adjustable, but the screen can also be split in a number of different ways to enable you to view all the processes at once. Noise Filters: One of the major issues with cheaper fish finders is that they have difficulty distinguishing the noise from the fish. This means that debris clouding the water can act as smaller animals, as can vegetation and other surrounding features. This fish finder is designed to filter out these components, known as noise. This sharpens the image on the screen, allowing the dual sonar to hone in on targets more clearly. HDI Transducer Included: One of the major points to mention is that this comes with a transducer. While this would seem obvious, some models at this price do not include this integral component, meaning you would need to purchase one separately. What’s more, this transducer is of very high quality, delivering powerful results for sharp imaging and precision. Portability: This fish finder is relatively small and can easily be stored locked away in a tackle box. In fact, you can put it in your pocket. This makes it a great choice for anglers who do not have their own boats and tend to rent or hire different crafts each time. You can easily hook it up and get going on whichever boat you choose. Equally, for kayakers or canoeists looking for a fish finder, this is a great one to hook on while you fish in your more portable crafts! As with all less expensive models, you tend to experience some drawbacks. Luckily with this model, the exceptionally high-level features and unique Lowrance technologies mean that the disadvantages aren’t all that terrible! That said, you should bear some of these drawbacks in mind before purchasing. Small Display: The screen display is only 4.3 inches which is very small. While the HOOK-4 color display provides a sharp image in high resolution, the screen itself can only provide so much. Equally, when the screen splits, the picture becomes even smaller, making it harder to read. In this sense, this may be a no-go for those with poor eyesight. No SD Card: The trackback feature is a great tool, however, the small screen can be a pain. For those who want to review their day more clearly, an SD card would be a simple way to transport the data to a computer. Instead, it has to be hooked to a computer. This also means it has very limited space to hold extra data. The space fills up quickly and you may find yourself having to erase data during the day. This can end in deleting crucial waypoints. No GPS -This model doesn’t have a GPS. While it records the places that you have been, you would need a separate GPS device to take you back to the waypoints that you have highlights for yourself. One of the key things about this model is its portability. This means that it is a versatile fishing tool. It can be kept in your tackle box and taken on all kinds of vessels, making it the perfect down imaging device for an angler who does not own his own boat. Equally, for fishermen working in smaller crafts, such as canoes and kayaks, this is a really great fish finder to carry with you easily. It is lightweight and doesn’t weigh down your vessel. This isn’t really a tool for professional anglers but is a great device for beginners and intermediate fishers. Those starting out will find it easy to come to grips with the device, while its durability makes it a hardy unit with great longevity. Also bear in mind that the screen is small, especially because of the separate buttons. That means this isn’t really ideal for someone with bad eyesight! If you’re looking for a simple fish finder that you can come to grips with easily, this is the device for you. Easily portable, this fish finder has unique dual technology, allowing it to search for fish across a deep, wide area. As far as affordable fish finders go, this model proves its worth with the excellent CHIRP sonar and split screen settings, enabling it to receive great images and translate this clearly to the user. This perhaps isn’t suitable for people with poor eyesight as the screen is a little small. Additionally, the screen is so condensed, you may find it hard to take advantage of the split screen display options. In any case, if you’re looking for a great fish finder at an affordable price, featuring top-quality technology and easy-to-use features, the Lowrance Hook 4x is a great product for you! With such a strong reputation and a solid 60 years of innovation behind them, Lowrance is certainly a brand to trust.